I haven’t been posting much lately as I’ve been extra busy with real life stuff. About month ago, I was told we would be able to foster a neglected Bulldog, who had been rescued. 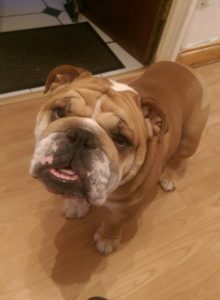 I don’t really have very much information about the nature of the neglect other than it wasn’t intentional abuse more like ignorance to all the hard work which Bulldogs need to maintain a healthy dog. 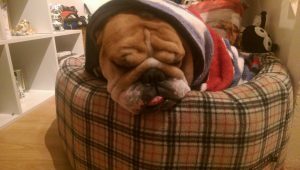 Bulldogs require lots of care, which most other dogs don’t require. This begins long before they are even born, almost without exception a Bulldog can’t have a natural birth, they are almost always C-Section born. This is just the start, you’ll find you often need to clean their bottom after doing their business. Their feet need regular cleaning as they are webbed, and prone to infections. The wrinkles and folds on their face need regular and routine cleaning and moisturising, again they are prone to infection. Their nose will often need moisturising with a little coconut oil to stop it cracking and drying out. The tear stains on their face will need cleaning regularly, their chin often needs drying after drinking water or it will go bald. The list really does go on… and on. I’ve only told you about basics of care so far, you still have dietary requirements which is costly and general health stuff with huge bills, not to mention the mountain of insurance. 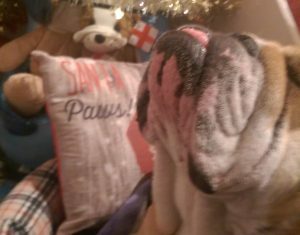 You need to be really really really sure you are ready if you take a bulldog on. Anyway we’ve fostered Bumble (4 yrs old) for a few months, while he recovers from surgery (a result of his neglect). He had his tail, stump, root and all remove surgically which resulted in his bottom pointing upwards instead of outwards. He also had a tumor removed so he was half shaven and and still a little sore when he arrived. This meant he didn’t need to recover in a kennel or at the vets cages, he gets to spent Christmas in a house, being played with, and spoiled until a forever home is found. I don’t think your allowed to keep the first dog you foster as they want to get you into the coming and going, so you can give many dogs a chance and a temp home. At first he was a little withdrawn and closed down, just seemed almost in a daze, or glazed over. We have had a few set backs, and a few minor concerns but nothing we haven’t been able to overcome. There has been no growling, no snapping, very little barking, by all accounts he’s fairly chilled and docile. I’d say so laid back if he didn’t follow you around, you’d need to check his pulse so see if he’s still awake. The other dog Barney has accepted him without any problems, they often share a bed, and play together. There is no fighting or shuffling when it comes to food or anything. A month later he’s bouncy, bubbly, and making his little spot in the house, perfect content. The scars are healing well, the fur has nearly grown back on his bum, his chin hair is growing back too and he seems happy. I don’t know if he’s going to end up withdrawn and unhappy again after his next move, but hopefully is next move is into his forever and final home, so he doesn’t have to be passed pillar to post.